Radio Rant: Gym Class Heroes ft. Adam Levine – Stereo Hearts | Ranting About Music! Hello and welcome back to Radio Rants! Gah, I forgot how uninteresting late August/early September was for the charts. By now, we’re so burnt out on our summer hits that even the good songs don’t sound that appealing anymore, but they still make up a sizable portion of the Top 20. 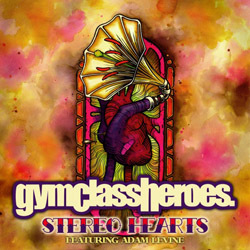 One of the few new Top 10 songs in Gym Class Heroes’ “Stereo Hearts” carried by featuring Adam Levine. GCH has always been kind of a fringe band; “Cupid’s Chokehold” was a Top 10 hit, but outside of that they’ve never had a lot of commercial or critical success. Adam Levine, meanwhile, seems to be on a hot streak. His presence as a judge on The Voice helped Maroon 5’s last album single upswing after falling somewhat off the chart, and the band’s tie-in single with The Voice, “Moves Like Jagger”, went to number one last week. I might riff on Levine for being a prime example of sensuality derailing thanks to a bad falsetto, but the man knows how to handle a hook. Much like “Cupid’s Chokehold”, I can see how this song became so successful, and Gym Class Heroes don’t have as much to do with it as they wish they did. The chorus is catchy, fun to singalong to, and upbeat enough. That’s not to discredit Gym Class Heroes. Levine might be the big name vocalist on the song, and have more airtime, but for my money, these guys are who actually make the track work. Travis McCoy sounds more confident than he has before (no doubt that whole solo album helped), and he has a calmer delivery than I’ve heard from him before. The reverb-laced, old-school production doesn’t hurt, even if Benny Blanco’s production shines a little too much on the chorus. The instrumental work on the song isn’t bad, but doesn’t feel entirely organic, which is somewhat off-putting. I’ve heard three or four other GCH songs in my life, but even after that few, I’ve been able to put together how McCoy comes up with lyrics for his songs: often between the title and the first few lines, you know what the song’s about, and the rest of the lyrics are puns around that. Hell, the band made a song out of other band’s names. McCoy doesn’t deviate from his norm here, but that’s not a bad thing. “All I ask is that you don’t get mad at me/When you have to purchase mad D batteries” is easily my favorite line here. I can’t really pick apart any lines here since each line gets back to the premise, which, while silly, works. It’s not a perfect song, though. While certainly not bad, it’s far from my favorite song of the year, and not something I could ever imagine myself clamoring to hear. The verses and the chorus suffer Black Eyed Peas Syndrome: they sound like two different songs pushed together for the sake of making one. Levine’s bright and shiny chorus and McCoy’s somewhat darker verses don’t go well together, but do quite well on their own. That hiccup aside, “Stereo Hearts” is kind of a hard song to write about. It’s not entirely good or bad, just decent in a not especially memorable way. Part of that is that the song can’t decide how pop it wants to be; McCoy and co don’t seem to be going for the charts, but the very same area seems to be on Adam Levine and pop-producer Benny Blanco’s mind. Adam Levine’s the reason most people will give this song a listen, but the band is why they should stay. This entry was posted in Radio Rants and tagged Adam Levine, Gym Class Heroes, Maroon 5, music, pop, radio, review, Stereo Hearts, The Papercut Chronicles II. Bookmark the permalink.